Can’t find your bike type - no worries! Call 020 3872 3050 or chat with us. Motorcycle transportation costs are calculated based on certain factors. For example, the transportation distance, required transporter and desired time-frame will all impact pricing. On average, motorcycle delivery costs around £2.50 per mile for distances of 50 or less. The average motorcycle delivery cost for distances of 50 miles or more is around £0.50 per mile. The above table shows indicative prices for transporting motorcycles between cities. For accurate costs, please use the form at the top of this page to get an instant price for your motorcycle move. 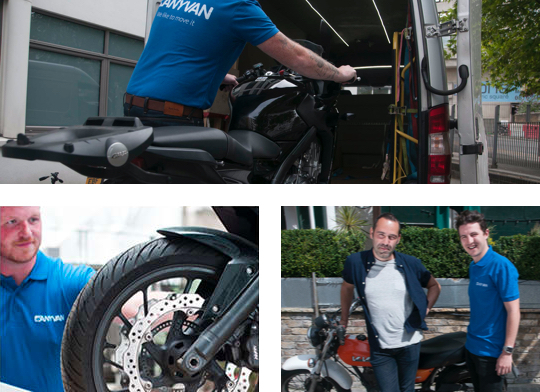 Arrange reliable and affordable motorcycle transport with AnyVan to get a better service for less. We’re comprised of expert vehicle transport partners who’ve moved thousands of motorcycles and scooters over the years. Get in touch for an instant price, free basic compensation cover up to £50k for fire & theft (in accordance with our Ts&Cs), and a dedicated transport coordinator to give you 100% peace of mind. Organising motorcycle delivery on a newly bought or sold bike should be a straightforward task, given their size. 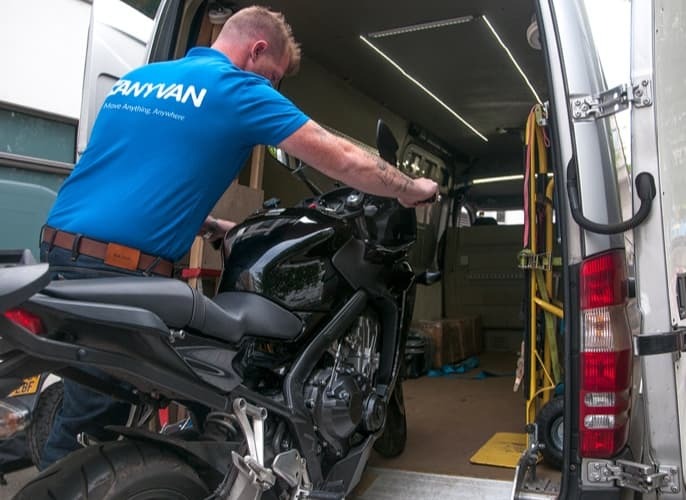 However, if you need to get your machine from one place to another without risking damage of your own doing, or without actually riding it, AnyVan’s delivery services are the easiest option. Using a professional transportation service is preferable to the DIY route. 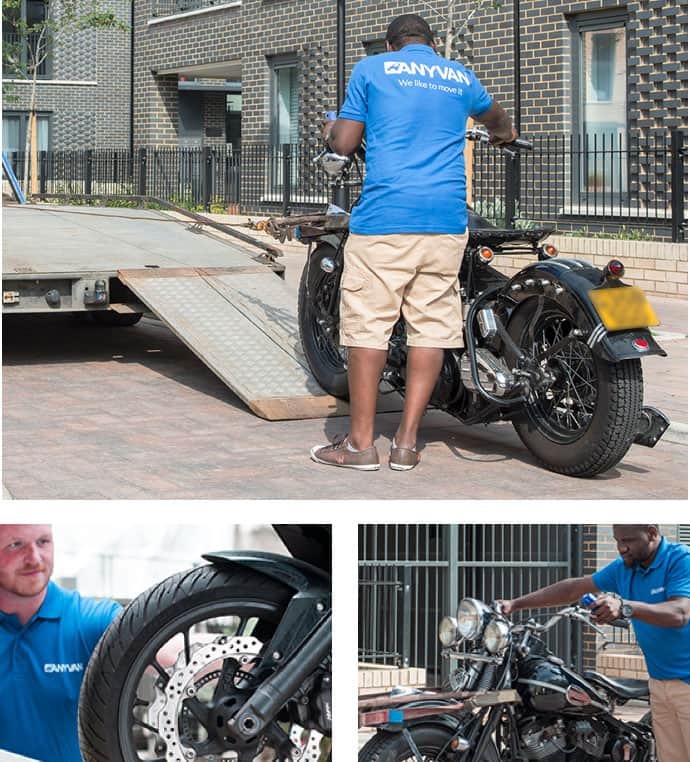 Find out why by using our five-star motorcycle transport service. Unless you’re an expert, advice on how to transport a motorcycle varies depending on where you look. While it is sometimes recommended to disconnect the battery and ensure there is no petrol in the tank, the simple task of securing your bike can result in a very expensive mistake. Whether you’re transporting a vintage Vespa or a souped-up Kawasaki cruiser, our experienced transport partners are more than capable with knowing what’s best in how to move your two-wheeler. Regardless of size, we promise we’ll save you money by making use of the spare capacity in our transporters as they travel along their existing routes. We know that motorcycle delivery needs are always different. You may have purchased a bike for a bargain price from a location in Europe, but have no way of collecting it. At the same time, you wouldn’t want to make a long trip across the continent on a new motorbike. Don’t risk clocking up miles and on-road damage. We have experienced motorcycle movers for all varieties. 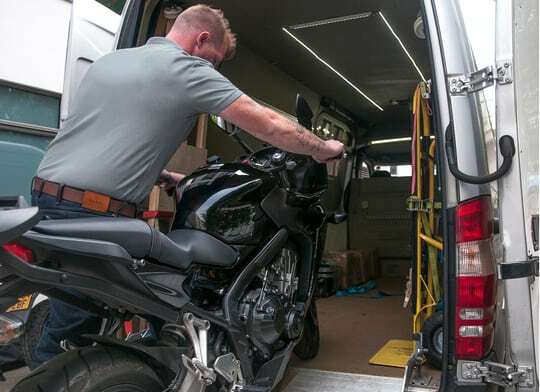 From tourers to ATVs, we will ensure your motorcycle finds its way home in a seamless operation. Use our platform to get an instant price to arrange a cost-effective motorcycle collection or delivery with experts at the helm.